Bernie Sanders just announced his endorsement of Randy “Ironstache” Bryce. This is Randy’s biggest endorsement to date — and it’s further proof that Randy has what it takes to repeal and replace Paul Ryan in Wisconsin. Watch the video here — then chip in to say you stand with Randy Bryce too! Over the past year, we’ve seen Republicans push to gut our health care system, deregulate Wall Street, and cut taxes for billionaires and corporations, while proposing drastic and cruel cuts to Medicare, Medicaid, and Social Security. As Speaker of the House, Paul Ryan has been the biggest proponent of this anti-worker, pro-billionaire agenda. But now Wisconsin voters have the opportunity to elect Randy Bryce — a veteran, cancer survivor, and union ironworker, who doesn’t just talk about the concerns of the working class in the abstract, but lives it and breathes it every day. 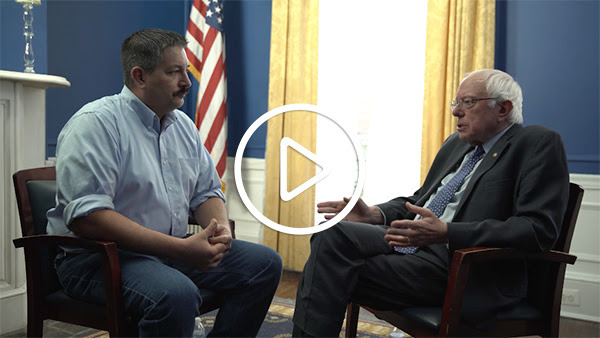 Click here to see why Bernie thinks Randy Bryce is the perfect candidate to repeal and replace Paul Ryan — then chip in to help propel Randy to victory.